This page is designed to help you choose the right multi-day adventure for you. Each of our trips is custom-designed to fit your criteria. We look forward to working with you to plan your ideal trip. To get started, please read the information below and then e-mail us at borealjourneysak@gmail.com or call 248 568 0345. Where you sleep is part of the adventure! We offer you the option to stay in log cabins or wall tents (or both)! Both are heated by woodstoves and offer the opportunity to thoroughly warm up and dry out. Cabin Pros: They are relatively spacious and cozy. They generally include bunks, tables, and windows. It is far less work to pull into an existing cabin and make a fire than it is to set up a tent camp. Cabins are full of rustic charm and each one is unique and handmade. Cabin Cons: We have to go to specific locations which can mean that we have to push through longer days on the trail to arrive at our destination. On most cabin trips aside from Homestead trips, you share a cabin with the guides, this is nice because the guides take care of the fire but gives you less alone time and privacy. Tent Pros: We can bring camp with us, which means we can stay almost anywhere overnight. This flexibility allows us to explore far from the beaten path. They are surprisingly comfortable, we set them up with cots and spruce bough floors. The inside is clean and light and you can hear the sounds of the evening around you. Tent Cons: They are smaller and involve sometimes awkward maneuvering to get in and out. Tent camps may take more time and energy to set up. Depending on the trip, the guides may camp with you in a large tent to tend to the fire which limits privacy. Can't decide? 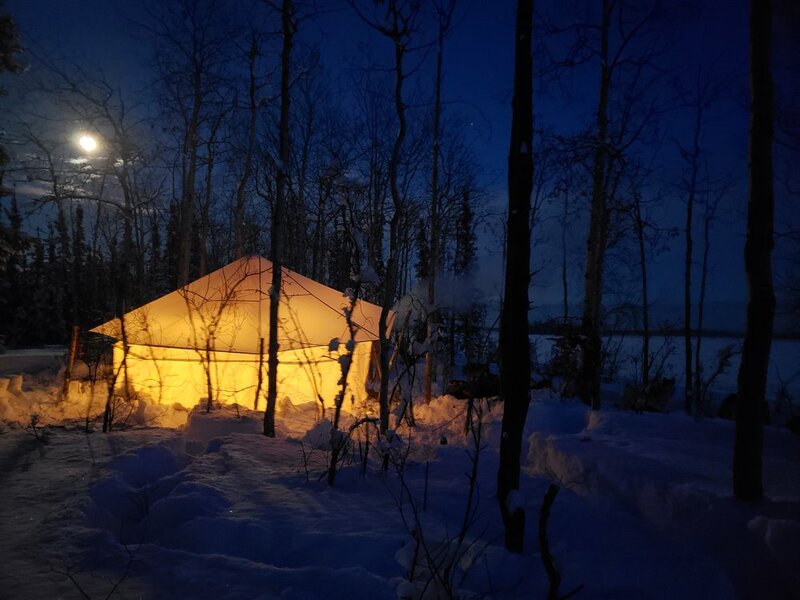 We offer trips like the "Taste of Winter Camping" that combine both! All of our trips involve some amount of travel, how much is up to you. On “traveling” trips we move camp every day or two, whereas “basecamp” trips involve going to an existing camp or cabin and exploring within a 10ish mile radius during the days. Traveling trip pros: Traveling in the winter is a magical experience. 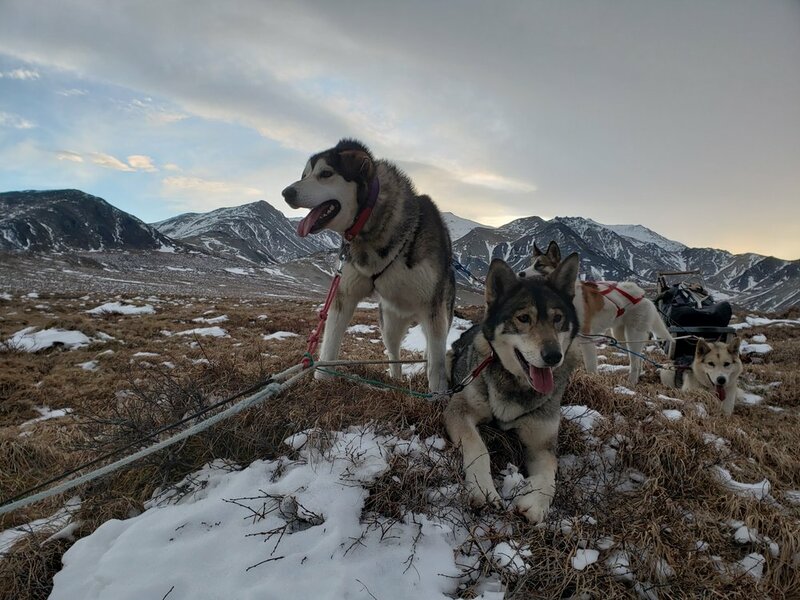 You can choose from traveling with a guide on a dogsled or under your own power on skis or snowshoes with the dogs hauling gear. Traveling trips are a good way to get exercise and see lots of country. They are also simple in that the daily agenda is mostly pre-determined: you pack up and spend the day moving to the next location, then unpack and settle in. Traveling trip cons: These trips often involve more exertion and less "down time" relaxing and doing other activities. Traveling trips also involve lots of packing and unpacking. Basecamp trip pros: Taking day trips from basecamp gives you the chance to try our multiple means of travel and test your skills at shorter lengths. They build in time and space for relaxation. 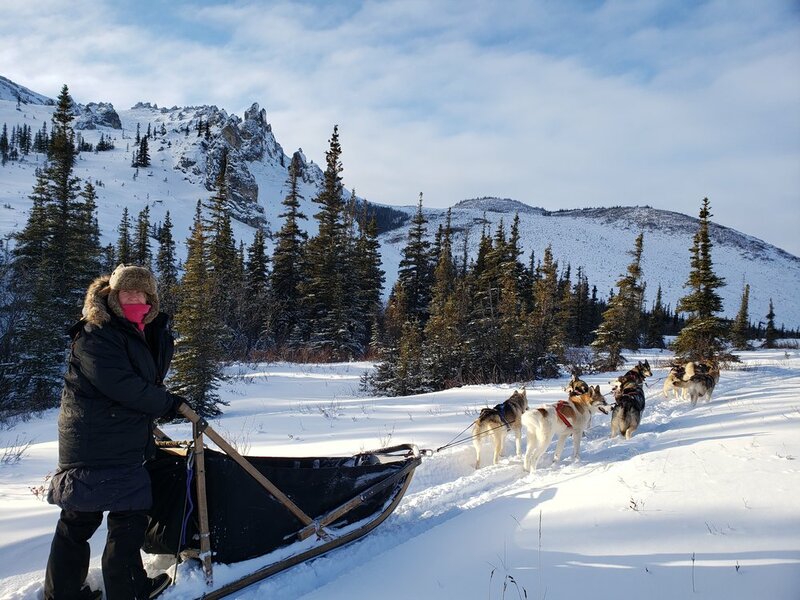 This is a great way to explore mushing, snowshoeing, skiing, ice fishing, and more all from a beautiful wild place! Base camping allows you to get to know a specific area in detail. Basecamp trip cons: These trips limit your scope to a smaller area. You don't get the experience of moving camp. If a particular place speaks to you, this is another good way to decide what trip to do. Click on the following images to learn more about trips in the areas that we operate in. 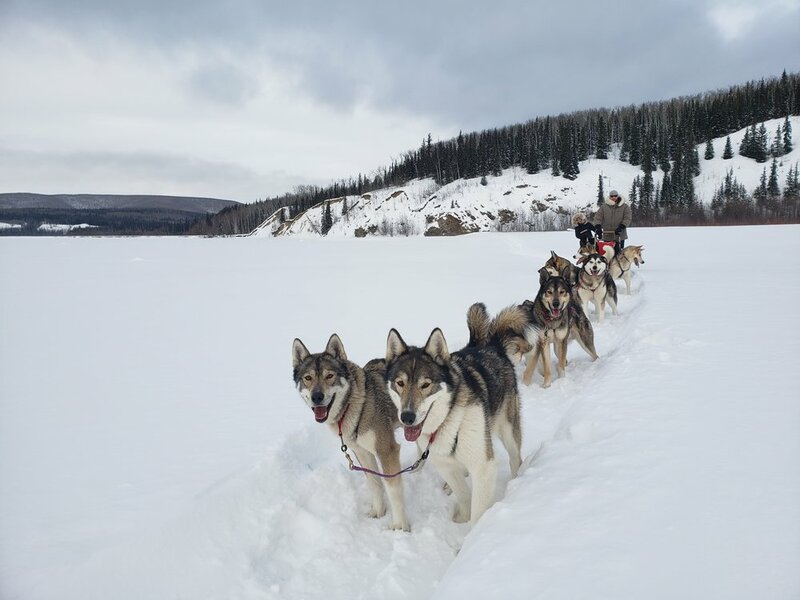 Located an hour north of Fairbanks, the White Mountains National Recreation area is a million-acre winter wonderland. A trail and cabin system allow us to access this incredibly scenic area of mountains, river and forest with ease. We have a special permit that allows us to use the cozy cabins in this area or set up a basecamp off the beaten path. They White Mountains are close, they’re wild, they’re almost heaven. 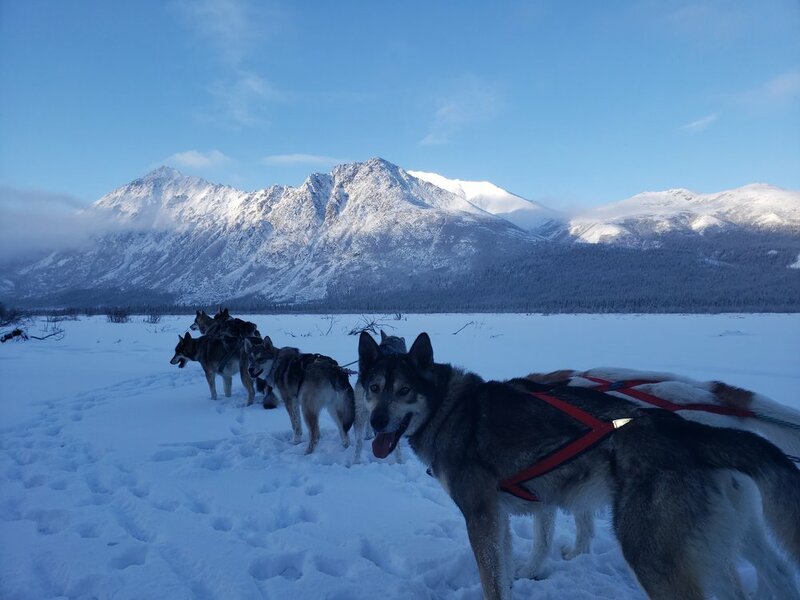 Trips offered here include: “Cabin to Cabin Dog Mushing” and “Mountain Basecamp”. 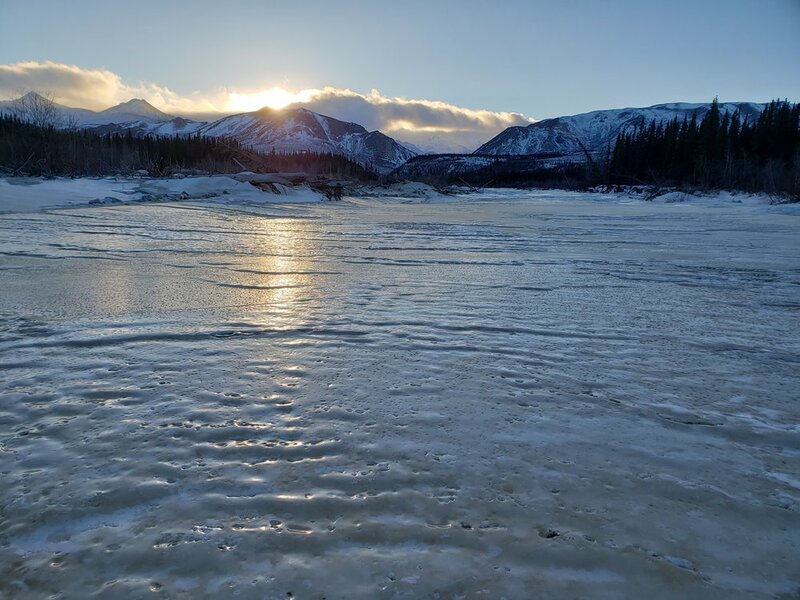 The Tanana River is the largest tributary of the mighty Yukon. Its the glacially-fed sinew that unites the entire Tanana River Valley, where Fairbanks is located. We made our home on a sunny bluff along this river and its unique beauty keeps us enraptured year-round. The river offers a sense of wide-open amidst a robust boreal forest and wetlands. Views of the Alaska Range and Denali loom in the distance. We are far off the beaten trail here and seldom encounter other people. This is the place we know best. We offer a variety of trips from our homestead including “Homestead Experiences” and “Taste of Winter Camping”. The Alaska Range is an incredible place, full of rugged and dramatic beauty. Its a few hours south of Fairbanks and well worth the drive. 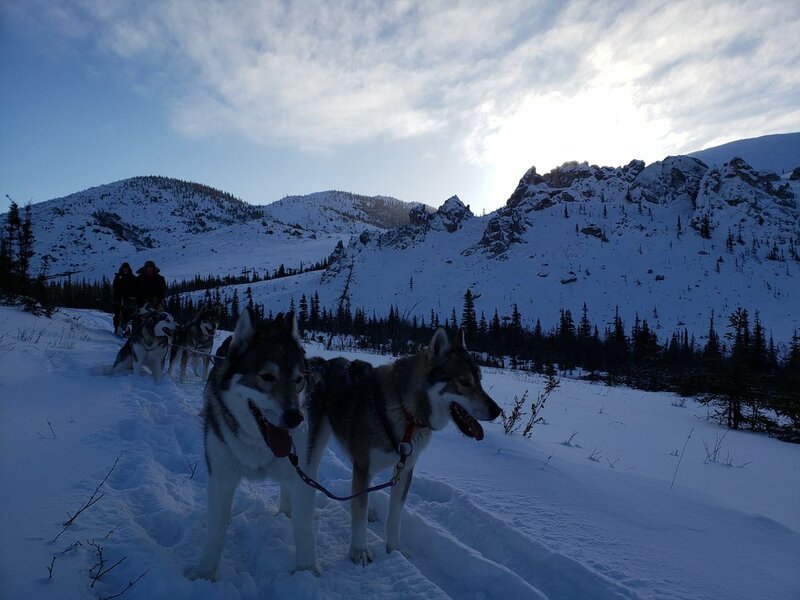 This is not country for the faint of heart, but if you want true adventure, there is nothing like exploring on frozen rivers and up mountain passes. Trips we offer in the area include: “Mountain Basecamp” and custom fly-in trips. 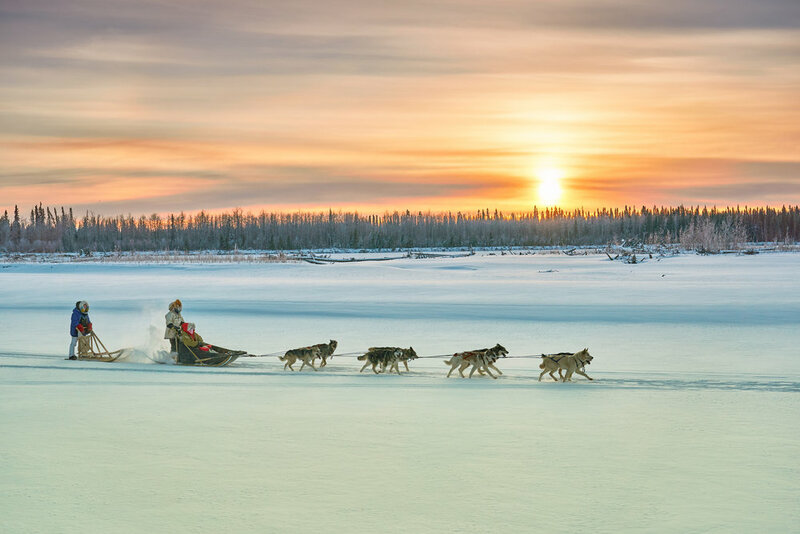 The true “last frontier”, Alaska’s Arctic is a place of unlimited potential for winter fun. 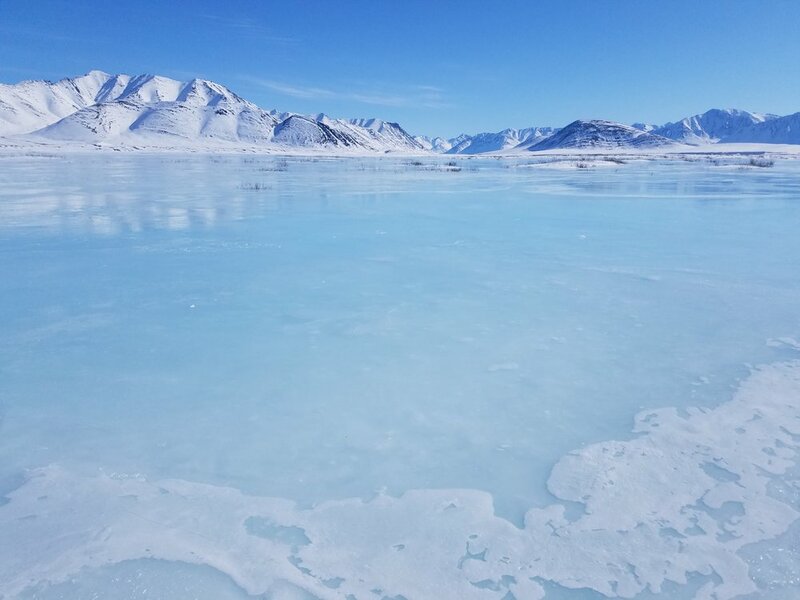 We offer special trips in the Brooks Range region in April when the days are long and sunny and the temperatures are surprisingly comfortable. If you want to really get out into the untrammeled wilderness, this is the trip for you. The remoteness is one of the things that makes traveling in the arctic such a rewarding experience. Trips that we offer include: “Arctic Basecamp”.